Apple today introduced the 3rd generation iPad, interestingly dubbed “The New iPad“, rather than the expected “iPad 3”. Keeping it brief, the New iPad’s updated features are a significantly higher resolution display, more powerful processor and graphics performance, improved camera, and 4G LTE wireless technology. The 4G LTE feature is certainly a big deal, as 4G speeds can be significantly faster than 3G. For those that use their iPads on the cellular wireless networks, this is a welcome new feature. However, given the limited reach of 4G networks, plus the fact that many people use their iPads over Wi-Fi, the 4G feature is not all that groundbreaking. The feature that Apple spent the most time on was the new display and graphics performance. Given that the resolution of the New iPad is 4 times higher than the iPad 2, it is quite a significant upgrade. 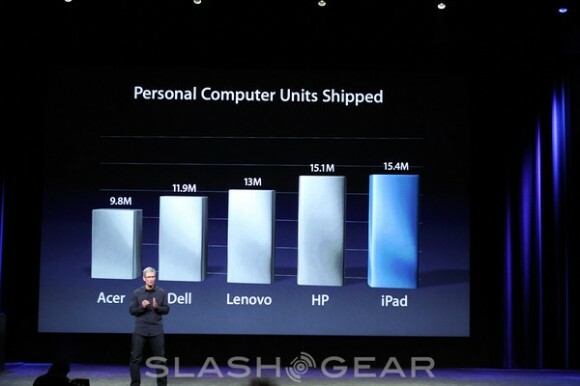 Listening to Apple talk about it, the new screen, which they call a “Retina Display”, redefines the iPad. Interestingly enough, Apple claimed that this is the first device they can not adequately represent through their on-stage projection system because the resolution of the iPad is better than the projection system. They repeatedly asserted that in order to appreciate the Retina Display of the New iPad, one needs to see it directly with their own eyes. That is a pretty strong claim. Also, Apple announced that they will continue to sell the 16 GB iPad 2 model (Wi-Fi only and 3G models) at $100 off their original pricing. For $399 and $529 respectively, it will be interesting to see how the iPad 2 continues to sell. I’ve been told by many people they were waiting for the price of the iPad 2 to drop before buying an iPad. My recommendation is to wait until you’ve seen the New iPad in person before making the decision between it and the iPad 2. If Apple’s claims are true that the Retina Display redefines the iPad, it is worth taking a look before purchasing. I stumbled upon an article titled, “The Best Tablet Not Always the iPad“. I was curious as to why the author thought this way so I read through it to understand his arguments. Not surprisingly, as is so common with most unfavorable reviews of the iPad or iPhone, the reviewer finds specific technical specifications of the iPad (or lack thereof), compares it to devices that have bigger or more powerful technical specs, and comes to the conclusion that the iPad is not as good as those other devices. Generally these types of reviews miss the forest for the trees and do not take into account the entire user experience that has made the Apple devices so popular. And many technical writers wonder why the general public is buying Apple devices like hotcakes while ignoring other products of arguably better technical specifications. The author bases his argument that the iPad is not the best tablet primarily upon another story that is linked within his article. That story states, “As we detailed in our Thrive [a tablet device] review, the full-sized USB port, HDMI port, and SD card make it a more productive tablet than the iPad.” Both authors have a pretty specific definition of “productive”, being that one can plug various other technology into a device without “expensive accessories”. And thus, we quickly see why so many “techies” have a hard time figuring out why the general public loves their iOS devices: techies think that in order for a device to be “productive”, the device must have specific technology features. The general public knows that being productive means that the device works reliably, is easy to use, and does what they want it to do. Most people could care less about ports. They have found little need to physically connect other things as much as some would lead them to believe. If you don’t believe me, the numbers the author claims to be astounded by should be the proof. If the general public had such a great need for ports or other technical specs, then the iPad would not continue to sell so well – especially to business users. The author states that he is astounded by the sales figures of the iPad, “considering how little you can do on an iPad out of the box”. I would find his opinion astounding, except for the fact that I have had many conversations like this with techie-types since the iPhone first came out. It simply comes down to the different ways of thinking the “Old World of Technology” has as compared to the “New World of Technology”. Again, he believes the iPad is limited because one can’t plug things into it right out of the box. Most other people believe the iPad is limitless out of the box because they can so quickly and easily get it working. Right away they are on the App Store downloading from an incredible selection of software that will make them productive without the need of a USB device, an SD card, or an HDMI cable. No other company can match the ease-of-use and user experience that Apple has provided for the iPad (and all iOS devices). This is the secret to Apple’s success and everyone else is struggling to simply copy Apple’s hardware – and still missing the point entirely!. The hardware is not so important when compared to the entire user experience. And if we want to throw down when it comes to technology features, I could argue that technologies like AirPlay make physical connectivity a thing of the past. Why bother with USB and HDMI when one can wirelessly stream their media? Especially when one can still have physical connectivity IF they need it with OPTIONAL accessories (and I don’t agree that a $29 adapter is expensive). No other tablet has a feature that even comes close to the reliability, ease-of-use, and acceptance of AirPlay, so if we want to play the geek card I think Apple still has ’em beat. I’ve written before about how consumers are now pushing their technology preferences into their workplaces. This change in how technology is deployed and utilized comes after the era where the IT departments of companies would dictate what technology their employees would use. By extension, what people used at work is what they generally used at home. Now, what people are using for their own personal or home technology is what they want to use at work, and increasingly forcing their IT departments to ensure compatibility. I first wrote about this almost exactly two years ago, but I had observed this trend at least a couple of years earlier. Yet it seems that some big companies still don’t get it. Case in point, I recently read an article where a self-described “loyal BlackBerry user and fan of RIM” explained why he made the difficult decision to return his RIM PlayBook (also commonly known as the BlackBerry PlayBook). Even though he feels the PlayBook is technically superior in some ways to the iPad , his reasons for returning the device were not about the technology. The fundamental pattern of technology adoption is shifting. In the old world, in which corporate IT departments determined which technology to approve and employees (users) simply had to follow suit, BlackBerry wielded a clear advantage. IT departments loved RIM’s solution for its security and reliability. But the winds of adoption are shifting. Employees are in the driver’s seat. They are convincing their IT departments to adopt the platforms employees desire. The winners of tomorrow need to create solutions that appeal to consumers, not just their employers. Such adoption shifts have taken down giants. He gives an example of beer purchasing in Japan, but we have examples much closer to home with Blockbuster and Borders. Companies failing to see changes in technology affecting consumer choices is a key reason they fail. This is nothing new, but yet it still seems that the lesson has not been learned – or many companies are just bad at executing change. It took me 45 minutes from opening the box to being able to explore my new PlayBook. When my wife bought her iPad, she was already connected, and exploring within 10 minutes. It’s time to make sure your company is recognizing the changing tides in technology. Don’t be late to the party like Blockbuster, Borders, and RIM. It is clear that eBooks are changing the book publishing world just as digital music changed the recorded music business and the Internet changed the news publishing industry. And certainly businesses must adapt to the changing landscape. However, it doesn’t mean that eBooks are a certain death for printed books or stores that sell them. I read two articles back in January (one from Newsweek, the other from The Washington Post) that relayed the story of Borders, detailing the mistakes that took down the company, especially their lack of both Internet and eBook strategies. The story of Borders is a case study in how technology can either create a business or destroy it. Borders came to prominence because of their technology. Their innovative software allowed the company to better predict which books consumers would want to buy and what to stock. This allowed Borders to create the model of a book superstore, offering not only bestsellers, but a plethora of harder-to-find titles. It is therefore ironic that what ultimately killed the company was the failure of Borders’ management to identify emerging technology and how it would change the competitive landscape. Take the time to read the articles if they interest you. But ultimately, the moral of the story is that the bad guy isn’t technology. Change is inevitable. It is the inability or unwillingness of companies to adapt that leads to their failure. It is the story of Blockbuster. It is the story of Ultimate Electronics. It is the emerging story of RIM (Blackberry) … and maybe even the not-too-distant future story of Microsoft. If anything, I believe the emergence of eBooks opens the door for smaller, local bookstores to successfully cater to those who seek printed books. They can provide services and the personal touch that big-box or Internet stores simply can’t. Perhaps, instead of mourning the death of Borders, we should be looking forward to the opportunity small business has in front of it.